Damien McCauley is a sweet little 5 year old boy who has battled every day of his life to live. He was born with a condition called Nephronophthisis (type 3) which causes liver and kidney failure, severe developmental delays, heart, eye and bone defects, lack of muscle tone and more. He does not walk and he does not eat by mouth; instead he is fed thru a feeding tube. He has suffered thru many surgeries and long hospitalizations including a liver and kidney transplant in June of 2012. During his 4 month recovery from his transplant, he suffered a stroke, respiratory failure, seizures, 2 bouts of pneumonia, MRSA and a hole in his stomach. His new liver is doing well but due to the many setbacks he suffered, his kidney did not take and he was placed back on the organ transplant waiting list... a list he has been on since he was just 4 months old. Due to the high medical and transportation expenses the family has, it is almost impossible for them to make ends meet despite the fact they have cut every possible corner they can. On Jan 6th, their only car broke down leaving them stranded on the side of the highway in freezing temperatures with Damien. They now have no transportation for the 300 plus miles they need to travel every week to get Damien from Maryland to Washington DC for treatment and no money to fix their car. They are using their rent money to pay for public transportation to get Damien to dialysis which he cannot survive without. They are having difficulty paying for the high copays for his medication and other related expenses which are unavoidable. All repairs that have been done on their car have failed thus far. Our goal is to raise enough money to help them with their never ending medical and travel expenses and to get them a reliable vehicle so they do not have the additional burden of car repairs to deal with. Gail-Damien's mommy here. First, I want to extend a HUGE thank you to each and every one of our supporters here at Dreams for Damien. I am so humbled by all the love and support we have received from people all around the world. While I may not respond to every single comment posted, I DO read them all and they mean so so much to us. I also want you all to know that we appreciate every form of support given, whether that is a kind message, uplifting prayer, gift sent, or share of Damien's story and this page. For all who have made donations, I want to say thank you for those also. Every single dollar counts and is so very, very appreciated. We can never thank you all enough!!! I wanted to wait until we were 100% sure we had a donor for Damien, however decided to share the news now. One of our supporters who has been trying to be Damiens match has passed the 1st two rounds of testing (the health questionnaire and the blood work). She now needs to fly from her hometown to Washington, DC for the final round of tests and to meet with the entire transplant team. She will spend 1/2 the day undergoing diagnostic and imaging studies (MRI, chest xray, etc) and the second 1/2 in meetings with the financial coordinator, surgeons, social worker, etc. Please know that while this is wonderful news that it is not set in stone. She MUST come to DC and complete the final round of tests in order to be considered a match. We ask that everyone who has asked about being tested to please KEEP GETTING TESTED because she still may be found to not be a suitable donor and if that happens, we dont want to have to "start over" because our supporters thought "oh, well they have a donor so I'm going to stop getting tested". Damien still needs us all to rally together!!! Thank you so very, very much for all the generosity and love all of you have shown our family as we continue our journey with Damien. Each and every one of you are so very appreciated and every single dollar is helping us reach our goal. As many of you know, Damien's liver labs are looking great again, however he is now showing signs of having issues with his parathyroid glands which is causing the high phosphorus and calcium levels, which in turn can lead to weak brittle bones (causing easy fractures/breaks), high blood pressure, kidney stones and heart disease. Please continue to keep our family in prayer. Thank you so much and God bless you all! I can't help with money, but I have a kidney he can have in a heart beat. If anything email me. constanceroberts392@yahoo.com. Hi. I didn't want to read to much of this. But I knew from what I did read that I know what I want to do. I cannot help at the moment with costs but I can help with a kidney. If you know what needs to happen after someone has offered please contact me. If I am a match, it is his. (347) 220-7211 Valerie Etienne - New York I will take a trip to Washington if need be. Any information on how to see if youre eligible for donation of a kidney? I live in Md. I have a brother who is 29 now, but was born at 1.4oz. Has a twin as well he is a healthy man today only struggled for his 1st yr. The brother who got all the damage had open heart surgery at 10 hrs old and has had small and large intestines removed, he has so many scars no belly button from so many surgeries. Fed through a tube and had port into his main artery in his chest to have fluid with stuff in it so he could survive and grow like normal kids. He finally started to eat when he was around 16. He is like a 5 yr old. In and out of hospitals his whole childhood. So I just stated all this and there is way much more but our family knows what yours is going through. 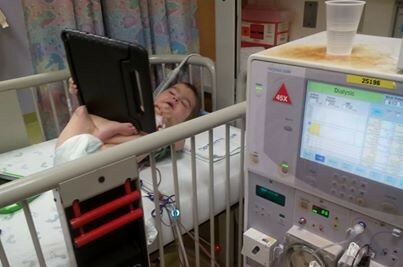 Your little guy is adorable and so strong, like my brother is. Kids are amazing fighters. I pray for you all. I just saw the video of Damien in the sink and you explaining to him that he can't drink water. That really touched me the fact that you need to comfort him and help him understand that he can't drink water. The one thing you would think someone could drink but he can't. I wish everything goes well for him and he's lucky to have parents like you. I just lost my granddaughter to this horrible disease...she was 24 hours old. We were told exactly the same thing there was "no hope for her". I pray for you and your child God heals all in time. sending prayers and sharing your story as I hope you will mine also. I would really love to send him some things if you didn't mind sending me your address. this really just touched my heart. my blood type is O Positive and im more than willing to give him my kidney. Hey little guy.. Even though i cant help you with cash or kidney. I assure you i can spread the word.. Everybody deserves to be happy.. It breaks me too see you getting hurt.. You have such a strong heart i give you that.. And to his parents and everyone who helped them. God bless you all.. If i am near i am very much willing to help in any way i can. Please dont give up .. I can not help financially but I can help by posting Damien's story on my time line and maybe some of my friends can help financially. I will keep you Damien and your family in my prayers that you get your transplant really soon. I can't donate :( don't accept my email address. Whay? I realy want to donate. I love kids. May God Bless and Keep You, Little Fella. I will pray for you.